I’m about halfway through my pregnancy, and I need to gain weight, eat more iron and continue to cope with nausea that — let me assure you — does not just strike in the morning. My solution? Cookies! These simple treats are loosely based on a recipe for chewy ginger cookies from the December issue of Food Network Magazine that I chocolatized and adjusted to my tastes. I figured they’d be perfect since ginger is known to ease nausea, and chocolate makes everything better. Plus, I used blackstrap molasses instead of the regular kind because it’s rich in iron. Win-win-win! 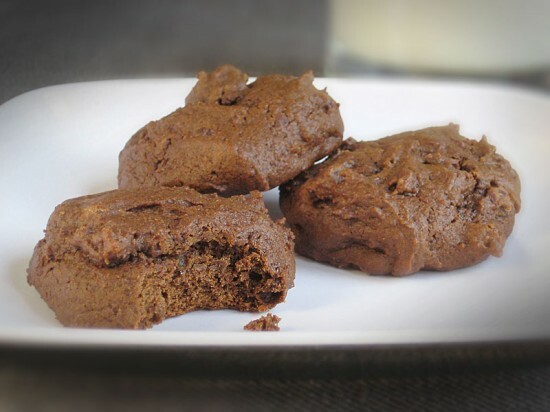 They look dense, but their texture is actually light and chewy. 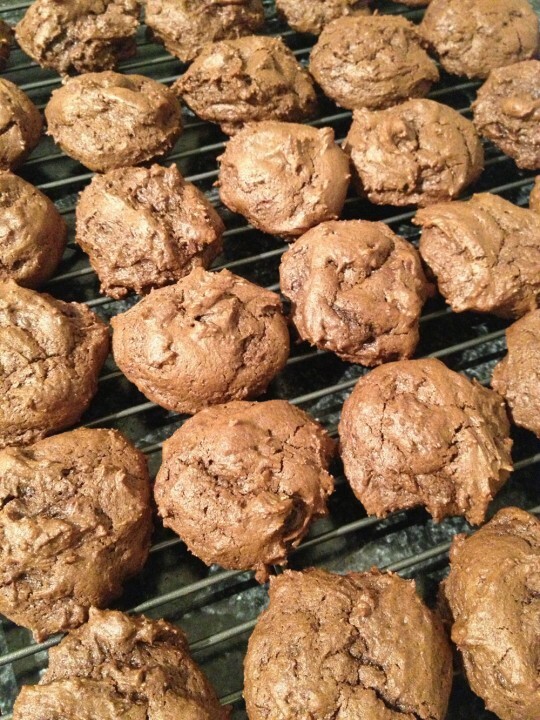 They’re nice and chocolately with just enough ginger and spice to add a warm, comforting flavor without overpowering. Even if it’s all in my head, these cookies make me feel better, and my husband and coworkers thoroughly enjoyed them too. Someday I’ll have to make them with my daughter and tell her all about how queasy she made me. In a medium bowl, combine the flour, cocoa powder, pumpkin pie spice, baking soda and salt. With an electric mixer, cream the butter and sugar together until light and fluffy. Add the molasses and the egg, and beat well to combine. Slowly incorporate the dry ingredients; then stir in the chocolate and crystallized ginger. Refrigerate the dough for 15 minutes. Preheat the oven to 350°. Drop tablespoons of dough two inches apart onto cookie sheets lined with parchment paper and bake 10 to 12 minutes or until just set. Mollee and her husband, Matt, live in Midlothian, Virginia, and are eagerly awaiting the arrival of their first baby (a girl!) in May 2013. (Check out her baby pool here.) Although she helps pay the bills by doing graphic design, Mollee’s true passion is for making things with her hands. Find more of her recipes, paintings and crafts at molleemade.com.